Page 66 — The Curious Case of the Moonlight Swimmer! For those who are interested in art process: I tried something new on the painting stage of this one: the dark, dark blue is Prussian Blue FW Acrylic ink, I applied that first, then was able to paint freely with the watercolour (mostly Daniel Smith Indigo, one of my favourite go-to neutrals) right across it. Sort of similar to masking, but in reverse. Then, white ink spattered over the sky, and some on the waves; finished it all up with some digital cleanup and a yellow tone for the moon, hills, and moonlit waves. Sometimes I think it would be so nice to just pop the colours in digitally; on a page like this it would have been so fast! But I like the painted-by-hand look more, and haven’t learned to simulate it digitally yet, though I know it can be done. It would be silly to change medium in midstream, anyway. Maybe on the next story! 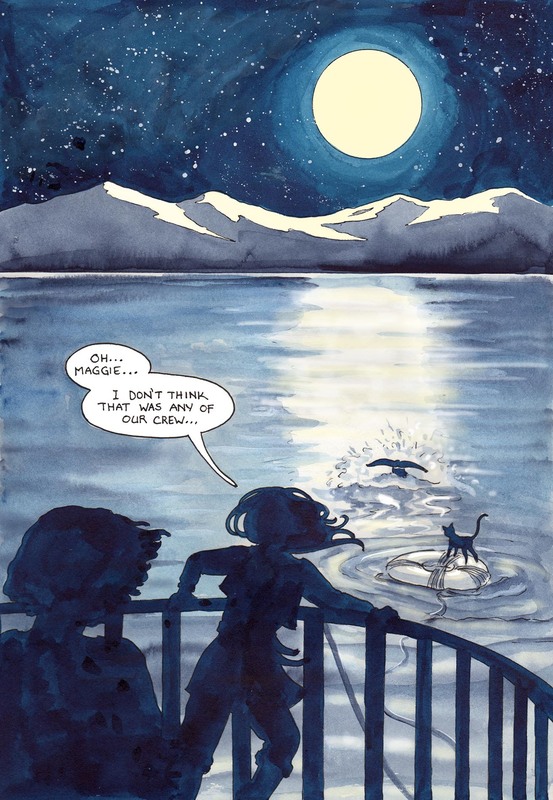 This comic was posted in Mermaid Music and tagged acrylic ink, art process, cat, comic, digital colouring, graphic novel, merfolk, mermaid comic, sailors, sea comic, ship, watercolour, webcomic.